Kennebunk Veterinary Hospital is aware of the vast amount of information available on the internet and how hard it can be to know what you can trust. Our team has taken the time to evaluate the options and want you to know we trust the information these websites provide. A project of IDEXX Laboratories, they are a great source of information about a variety of health issues. 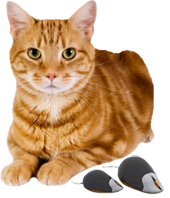 Click the paw below and it will take you to the Pet Health Network website. From there, you can search for topics or create an account. You can also reach these articles from your Petly page. Let us know if you are left with questions or need our help with your pets' health!